Are you enthusiastic about kids? 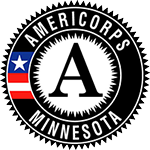 Consider becoming an AmeriCorps LEAP (Learning Early Achieves Potential) member! We have 20 full-time positions available. Apply online now! The goal of this position is to build SMIF's Prosperity Initiative program capacity to develop, test, and implement a framework of business support for minority populations across a 20-county region in southern Minnesota. VISTA member service will produce a robust 3-year program through development and implementation of conversations with key partners, development of volunteers and creating strategies for entrepreneurial success. One full-time position available.